I consider myself to be a fairly logical, rational sort of person. I have become pretty boring since turning 30 and am not prone to random spontaneity or great frivolity these days. But every so often I go through phases where I am sure, convinced in fact, that every idea I have must be a Really Good Idea™. All critical thinking goes out the window. My husband has learned to deal well with these phases, interfering only where strictly necessary, and thus preserving domestic harmony. (You can actually see him calculating whether any given idea will a) cost a lot of money b) cause harm to any living species or c) involve him having to rectify it down the line. If the answer to at least two of the three is negative he nods with abject resignation and allows me to proceed unfettered). One idea that fell squarely in this category was my attempt, a few years ago, to grow all manner of fruit and vegetables in our back garden. Our northerly facing patio garden in central London with approximately 2m² of (already planted) flower beds. I don’t remember what started it. I suspect I got all swept up reading Tender by Nigel Slater. So I went online and found a company called Rocket Gardens, who send you boxes of little ready to sow plants (I think they are called plug plants in the trade), thereby creating a sort of ‘instant’ vegetable garden. I mean, I was pretty sure I could cultivate my own wildly successful kitchen garden with no previous experience but obviously it made sense to let somebody with a greenhouse and some actual plant skills do the tricky growing from seed thing. I ordered the Patio Container Garden box. Because that sounded like just the ticket for me and my patio. And added a couple of fruit tree things too for good measure. I glossed over the bit about needing a reasonably sunny space and deliberately ignored the part about this selection of plants requiring around 8m² (yes, 64 square metres) of containers, grow bags etc. I will concede that when the world’s largest box arrived on the doorstep and we unpacked no less than 130 plants, a small flicker of doubt passed through my mind but on I ploughed, undeterred, planting everything far too close together and wilfully disregarding all accepted gardening practice. Along with the size of my patio, I also wildly overestimated my interest in gardening (what do you mean some plants need a different type of soil? You feed them what?) and my ability to stay interested in something that didn’t grow immediately and thus remember to water them and ‘pinch’ out leaves and blah blah blah. Suffice it to say, it was not a resounding success and I unfortunately had to admit defeat and look to Waitrose to keep us in fresh provisions. I seem to remember that I harvested 4 green beans (FOUR!) and successfully grew some salad leaves and some chilli. The tomatoes were utterly vile (it was a pretty crap summer, which I like to think was to blame, rather than my wanton neglect) and I have blocked out all memory of the fruit. (I really must stress here that this does not reflect at all on Rocket. This was all a product of my own idiocy and laziness. I have purchased several ‘gardens’ from Rocket for people as gifts and they have enjoyed Great Success (as Borat would say). If you are interested in branching out into growing your own I really do wholeheartedly recommend them). 1. Radishes. These are allegedly very easy to grow. Indeed, I found some seeds that were specifically marketed at small children. So if they don’t grow I will definitely feel like an abject failure. I like radishes enormously, and they are nutritionally dense, but I do struggle to get through a whole shop-size bunch before they go off as there really isn’t that much you can do with them. 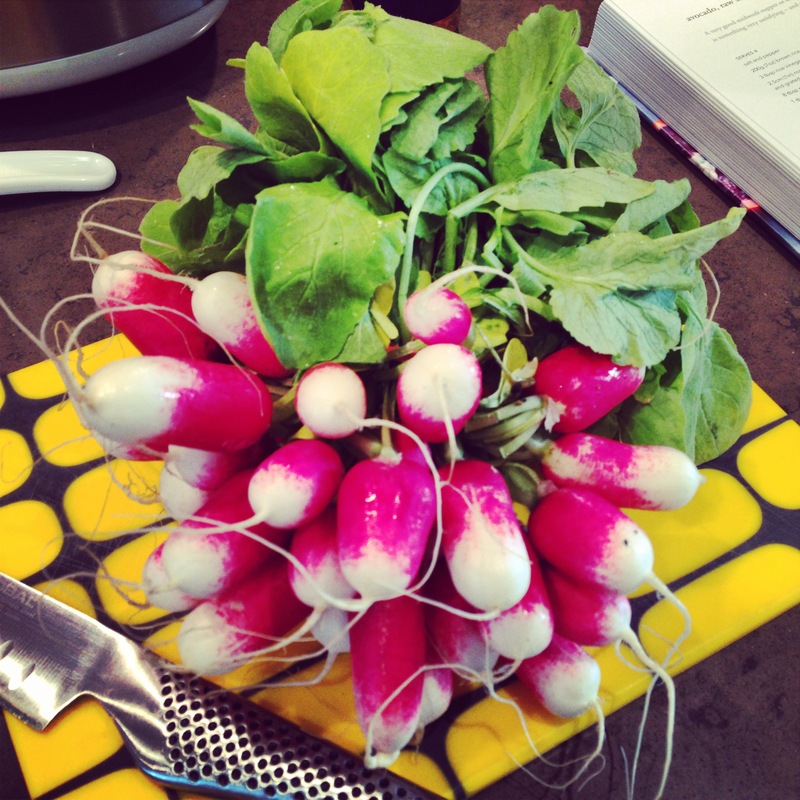 I figured growing and ‘harvesting’ my own was therefore the answer to my radish conundrum. 2. 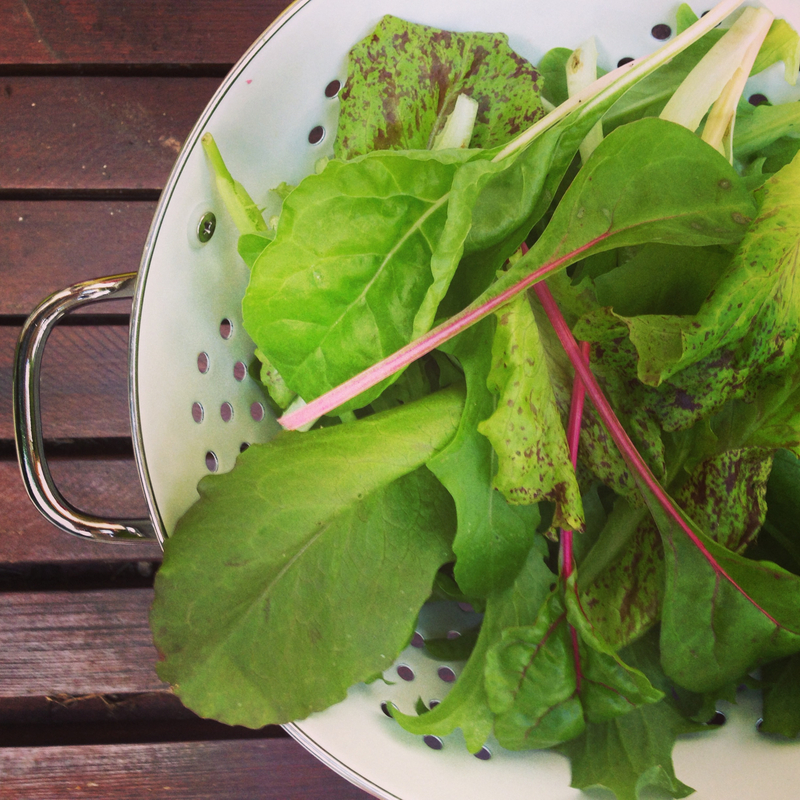 Salad Leaves. These are one of the only things that I did successfully grow last time round (because you could basically teach a monkey to tend to them) and they really do taste better just cut from the garden than they do from those supermarket bags, the content of which has often been sitting in cold storage for weeks before you get it home. If you are anything like me, at least half of those bags go into the bin too (and I know it isn’t just me. You do it too. Let’s be honest here. Tesco did a survey last year and a truly staggering percentage of bagged salads end up in the bin each week). This year I have a mixed salad box that I bought from Daylesford and am going to replant in one of the 548 containers we have left over from the previous experiment. I have managed to keep them alive for at least 3 weeks so far so I have high hopes. 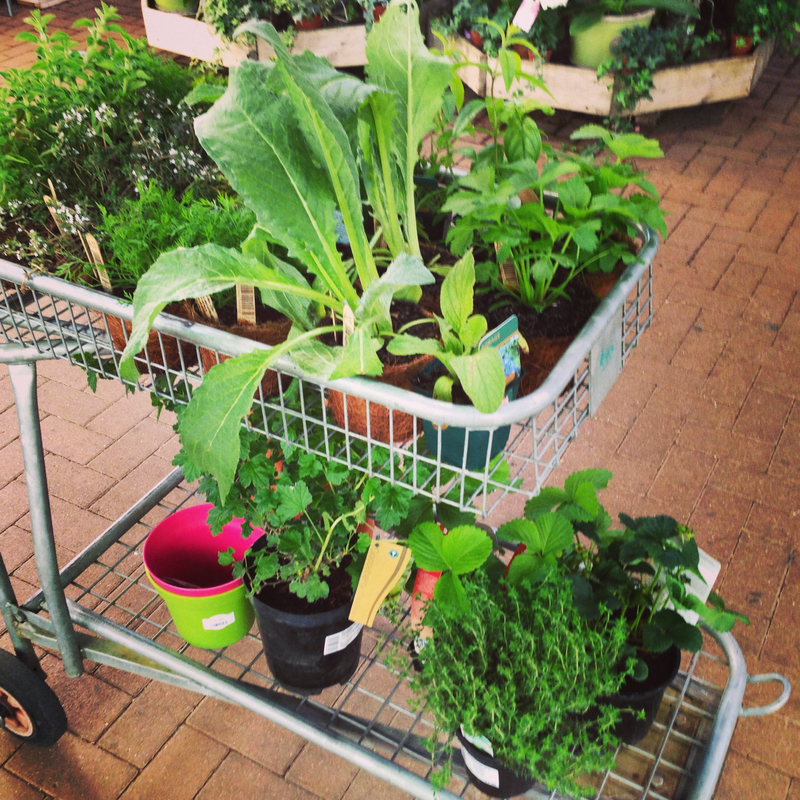 You can buy ‘living salads’ from most supermarkets now too and can easily plant them out. 3. Tomatoes. I am having another go at tomatoes. For no better reason than the fact that I am British and growing some really quite average tomatoes in a grow-bag is what we do and then go and buy some from M&S to eat. 4. Gooseberries: another possibly ill-advised foray into fruit but someone told me they were quite easy to grow. And I like them. And they are not always that easy to buy. Those are my reasons. 5. Strawberries: I think I mainly settled on these because I thought The Child might like seeing them grow and picking them. He has already picked off at least six green ones so I think I was accurate in my assessment. And it was also an excuse to buy one of those terracotta strawberry growing pots and they looked quite cool at the garden centre. 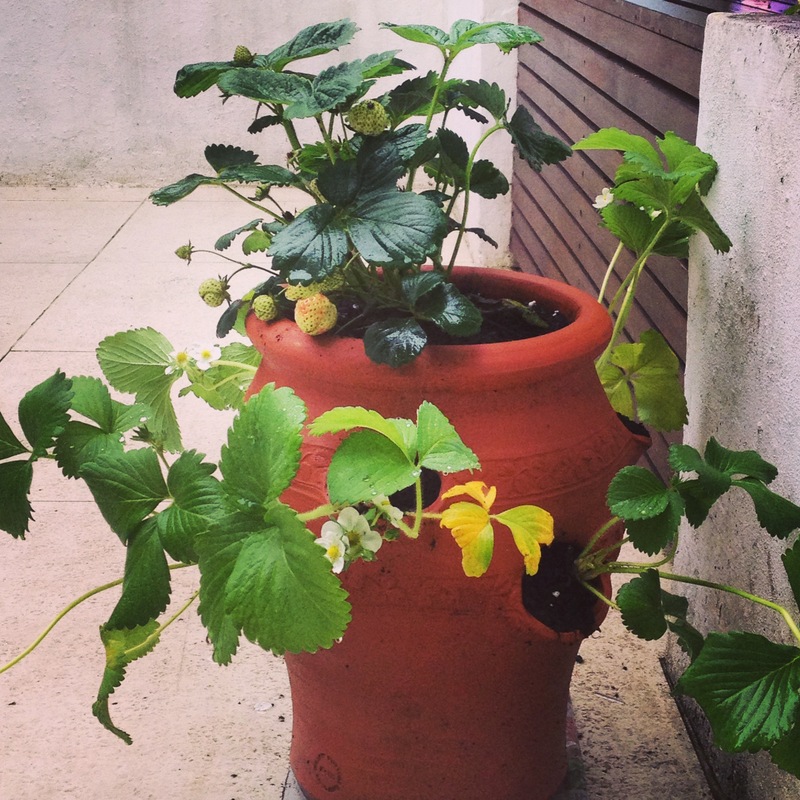 I am expecting a yield of at least 7 strawberries this year. 6. Herbs: These are something I definitely am trying to make an effort with. I have conceded defeat with coriander (and am assured that commercial growers in the UK struggle with that too) and parsley (which seems to get eaten by everything) but have managed successfully to grow mint, chives, sage, thyme, basil, bay and oregano in the past. This year I have also added some things that I would like to cook with more, but which are really hard to get from the supermarket, namely: lovage, chervil, borage and lemon verbena. Oh, and Vietnamese mint (Rau Ram) because I’d have to trek all the way to Hackney to get that and that certainly ain’t happening on a weekly basis (although the Fabrique bakery in Shoreditch – who make the best cinnamon buns in the whole world – mean my trips eastwards are more regular than when, for example, my sisters lived there). Why I am telling you this? (Possible Answer: because it’s my blog and it isn’t any weirder than telling you what I eat from time to time is it?). Another Answer: because I am hoping at least some of you will have some fantastic gardening advice to give me. TELL ME YOUR SECRETS so that I can avoid failure once again. I will update you all on my progress (contain your excitement, please), provided of course that I am successful. If you hear no more about this you can assume the worst and we shan’t speak of it again. And now here is a really truly fantastic salad using things that I absolutely won’t be growing in my back garden – fennel and citrus fruit. I have acquired something close to an obsession for fennel and orange based salads of late. It started when blood oranges were in season but has stuck and I eat this, in one form or other, once a week using oranges or pink grapefruit (or both in particularly decadent weeks). 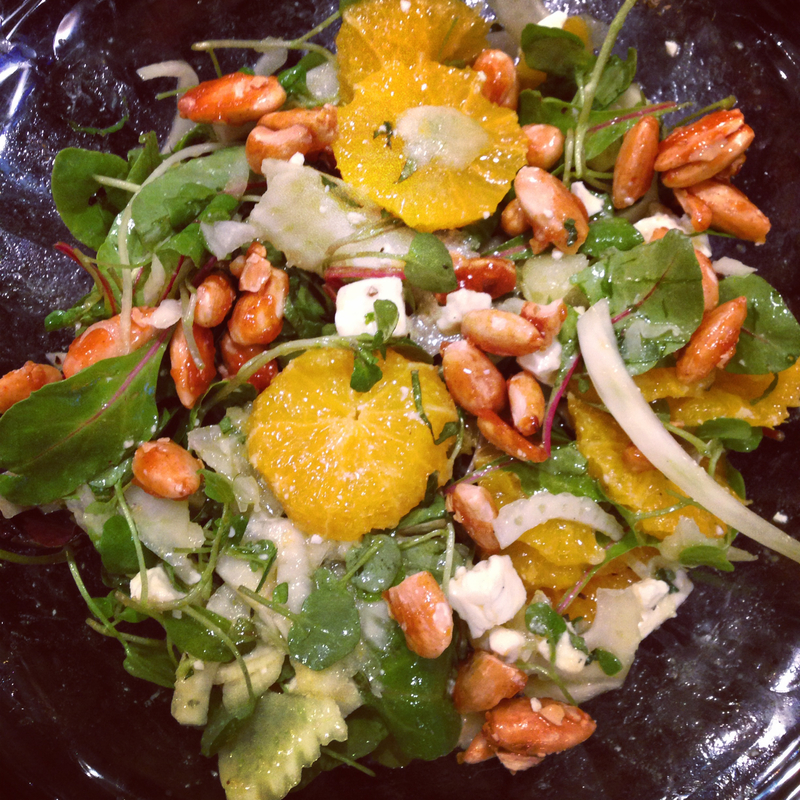 The version in the pictures is a Diana Henry recipe from Change of Appetite and depicts the salad in one of its more fancy incarnations – with watercress and spicy caramelised almonds that you make yourself (it takes 5 minutes). It is a brilliant starter if you are ‘entertaining’ as you can throw it all together and just dress it at the last minute but makes a very nice lunch for 2 and the feta and nuts mean you are getting a good dose of protein and healthy fats to keep you going all afternoon without a Kit Kat. I am not going to set the recipe out again as it is here on the Metro website, so that would be a waste of time. 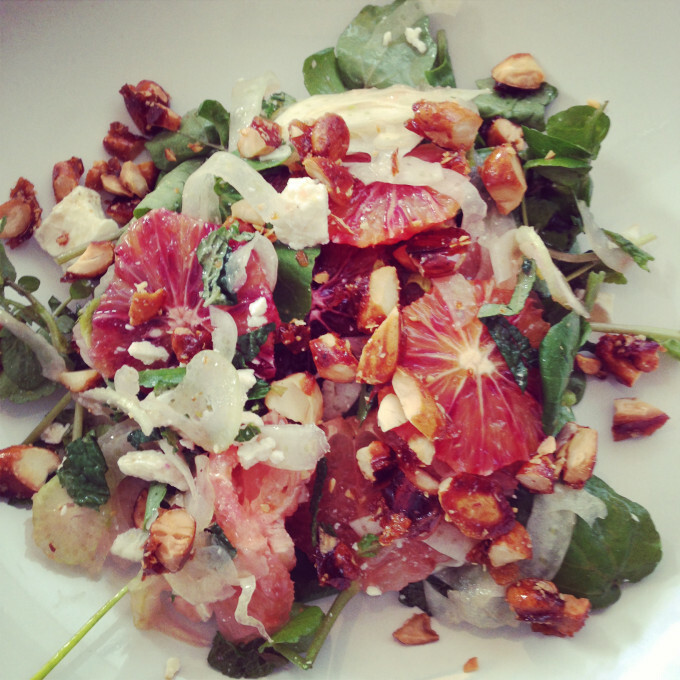 What I am really trying to do though is alert you more generally to the awesomeness of the orange, fennel, feta combo. You will find countless recipes online, which use a variety of nuts (walnuts and hazelnuts are popular) and many which add something sweet like cranberries or dates. Pomegranate seeds would make a good (and pretty) addition too. Goat’s cheese (or curd) is a common alternative to the feta – if you have trouble finding goat’s curd (and you will unless you live near a decent cheese shop or farm) I find that the Rosary goat’s cheeses that you can get in supermarkets make a decent enough substitute as they are creamy and quite mild. Peeling the oranges and removing all their pith is a pain, I won’t lie to you, but if you use a serrated knife it is pretty easy and after a few goes you will be a master at it. These salads are perfectly fine with the orange peeled, de-pithed and sliced into discs, so there is no need to go further and get into the even greater hassle of segmenting them (but you could of course do so, should you be adept in this regard). UK grown fennel is pretty thin on the ground I find but I can’t really get very upset about buying the stuff that makes it way to us from Italy. It’s not like we are taking about asparagus from Peru, is it? If fennel is your thing, you can also check out Nigel Slater’s beetroot and fennel slaw, particularly as UK beetroots are just about to spring back into season. I’m off to stare blankly at my new plants and wonder what to feed them. Try blueberries. One plant, one big pot, looks reasonably pretty even when not fruiting. I have had one alive for 3 years and for me and kit less than green fingers, that is pretty impressive. Kids love watching them grow and picking them. I ephod guess we yield a punnet a year so no a groundbreaking amount, but pretty satisfying. Oh and tomatoes, pick small and sweet (yellow sungold are my favourite). In my opinion the English climate is in no way capable of ripening a full size tomato unless under glass. Good luck! Apologies for the typos – writing on the go! For ‘kit’ read ‘my’ and for ‘ephod’ read ‘would’! Yes mine is in a big pot. Good luck! Big pot – good luck!